As an appraiser, dates (more commonly called circa dates) are very useful. We learn to recognize circa dates of antique and vintage jewelry by the findings, style of execution, gems, cutting styles and metals – just to name a few clues. If you are examining a blue topaz ring, you would not classify it as an antique. There are lists available to reference when sleuthing circa dates as found in various scholarly valuation books, articles and pamphlets. Often, I have a client claiming that an heirloom was brought over by her family in the 1700s. To verify or discount that claim, I first see if it is white gold. White gold, depending on what circa date list you like to use, is either 1915 or 1920 as a base circa date. But is that true? To those who rely on the 1920 circa date, they point out that David Belais filed a patent for 18KT white gold in 1920.1 And that patent exists, but it was filed October 5, 1918, thus the circa date should logically be 1918. He has another patent for white gold that was filed October 24, 19192 and patented in 1921. And, if two were not enough, he has a third one for 19263, that was filed April 30, 1921. 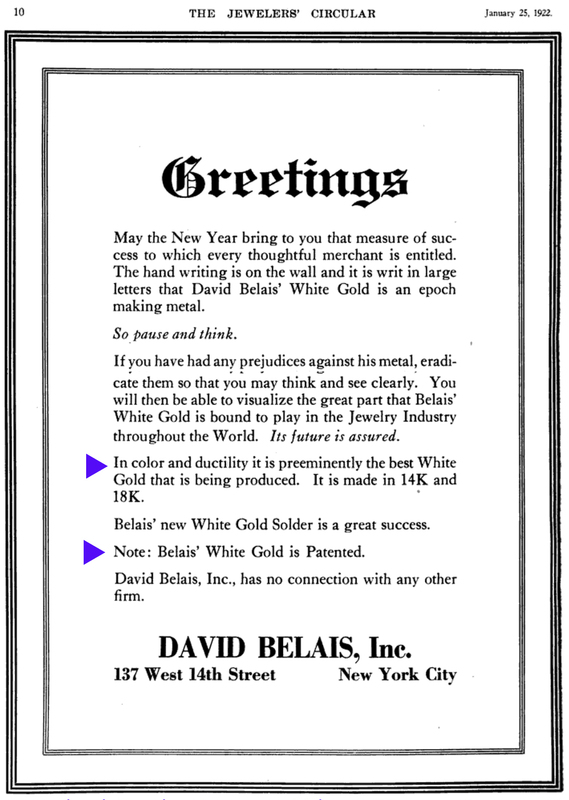 David Belais was a well known supplier of white gold during the early 1920s. Even today, vintage rings with his trademark are pitched as “… own a piece of jewelry history.” But whose history? You see the trademark ”Belais” comes in various forms. The trademark was listed as “Belais 18K ” in 1922. However, at least two companies used the trademarks extended with abbreviations, as found with "18KT Belais W.B.” for Werner Brothers and “Belais 18K E & L” for Englander & Leblang, Inc.7 In 1934 merely “Belais” was a trademark for H.A. Wilson Co. of Newark, New Jersey as well as “David Belais .” Just be careful to read the entire mark before making an attribution and a circa date as some pieces of jewelry are stamped with a quality mark and two trademarks. But was he the inventor of white gold? There is another patent for white gold that is dated from 19139 filed by Karl Gustav Paul Richter who lived in Pforzheim, Germany. Keep in mind that shortly afterwards, World War I occurred. Thus, very little is known about this “white Gold” other than the patent10. Without a doubt, David Belais was not the inventor of white gold as some jewelry experts claim. Who are the Goldsmith Brothers12? 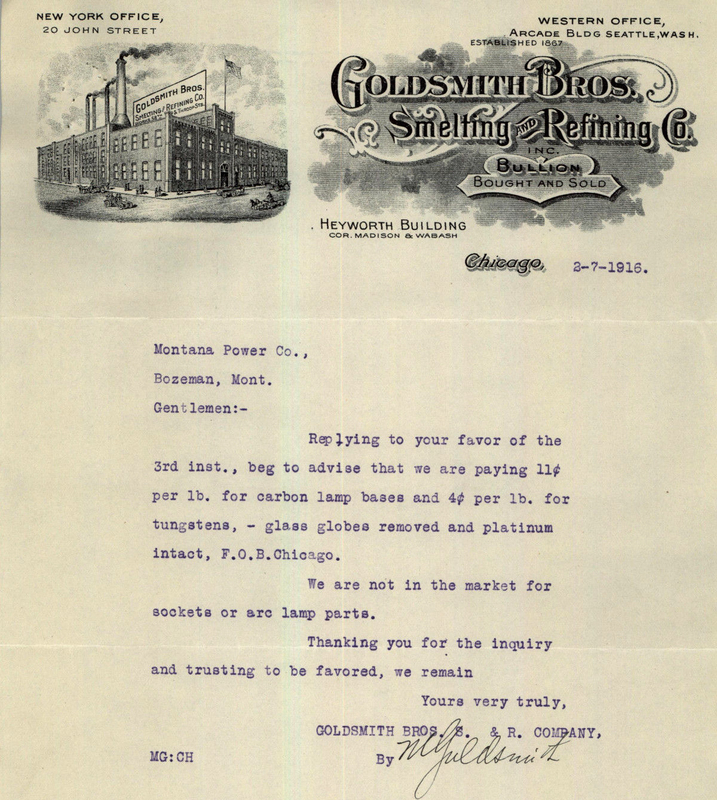 Marcus Goldsmith founded the company in 1867 in Chicago, Illinois. His two sons, Moses and Simon, incorporated the business as Goldsmith Brothers, Smelting & Refining Co. sometime in the 1880s. In 1959, they merged with NL industries13. Note: Left is a letter from Marc Goldsmith, President of Goldsmith Brothers, written in February 7, 1916 - from the author's collection of jewelry related Ephemera. Now we have pushed back the circa date to 1913 … however, is that white gold’s oldest circa date? Now we learn that white gold was being made prior to 191317. The court continued “In addition to Haffner and Sheff, evidence was produced to show that Baker, Herpers, and Handy & Harmon, prior to the patent herein, made gold alloys … Skilled workers in the art knew, long prior to 1918, the effect of varying the proportions of the several base metals in white gold alloys”. David Belais lost his case – his white gold was not really an invention but rather a new formula for what already existed … white gold. 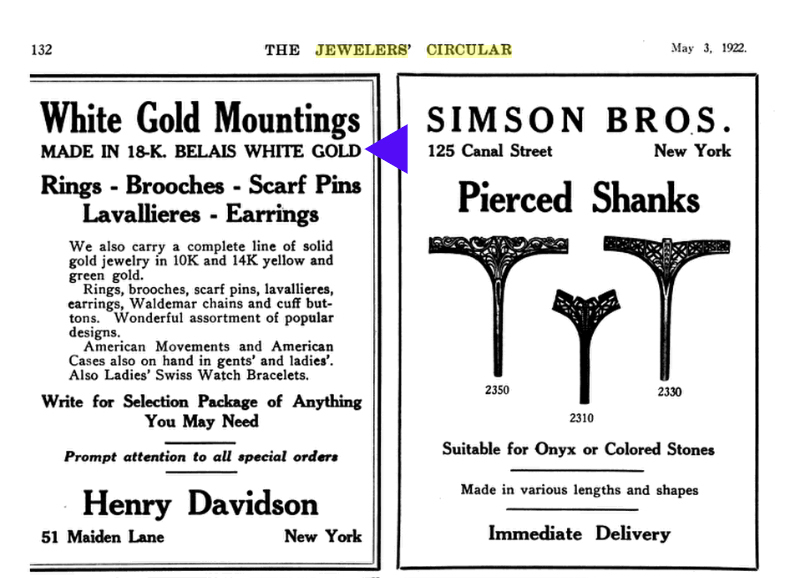 It was tantalizing to discover that white gold was being used before the 1913 circa date. But when? I reviewed trade publications from the late 1880s up to 1910 with no mention of white gold. 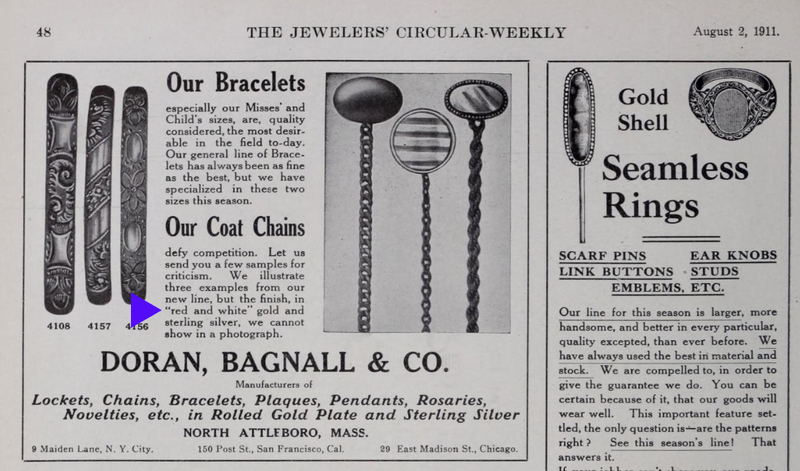 However, in a 1911 publication white gold was mentioned in advertisements18. As we march into the future, the past becomes less clear. 1911 is over a hundred years ago and we cannot simply call or email someone to ask them to verify or add precision to a circa date. Thus, circa dates are theory and subject to change.